Countdown to Avengers is a blog crossover between Nerd Lunch, To The Escape Hatch and the Cavalcade of Awesome. Together we are reviewing all of the solo Avengers movies as well as some of the comics and cartoons. 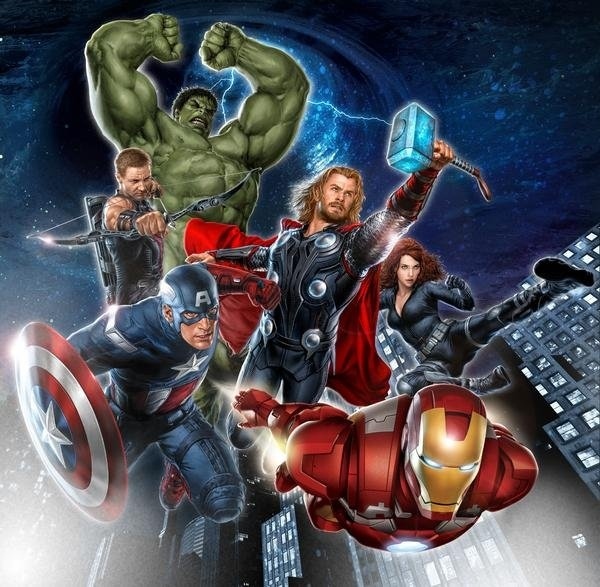 It’s all leading up to the release of The Avengers on May 4 where we will all review the new movie. So, by this point we have talked about our thoughts on most, if not all, of the movies that lead up to The Avengers. Now, I want to look at some of the ancillary promotions for The Avengers. I’m “the soda guy” of the group so I’m a complete sucker for any big pop culture movie/soda promotion (see my write ups on Star Wars soda promotions here, here and here). So today, I’m going to discuss the big Marvel soda promotions that have happened from all of the Marvel movies including Iron Man 2, Thor, Captain America and the upcoming The Avengers. Unfortunately, there were no soda promotions for the original Iron Man or The Incredible Hulk in 2008. 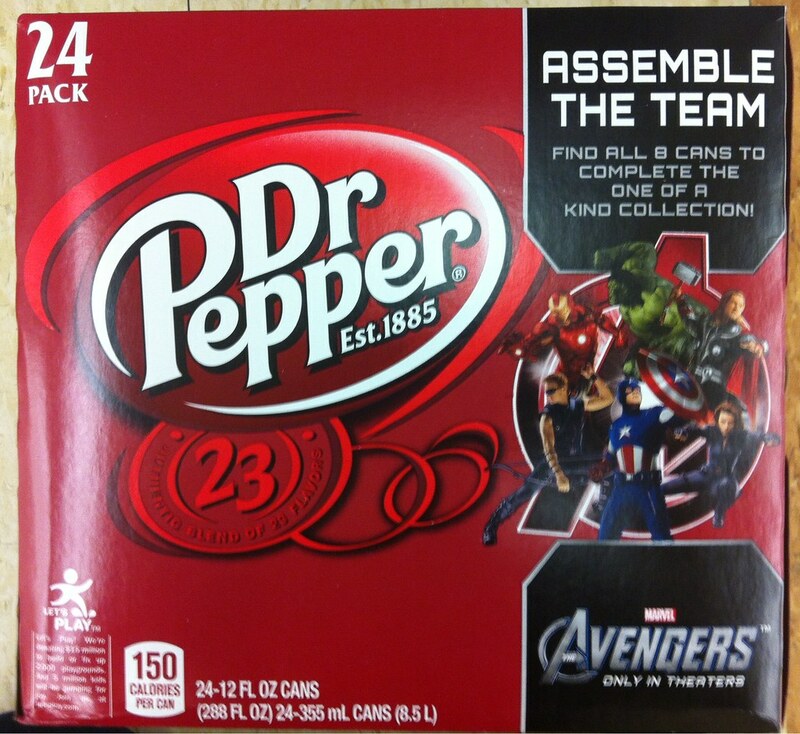 So, let’s start with the current Avengers promotion going on with Dr Pepper. 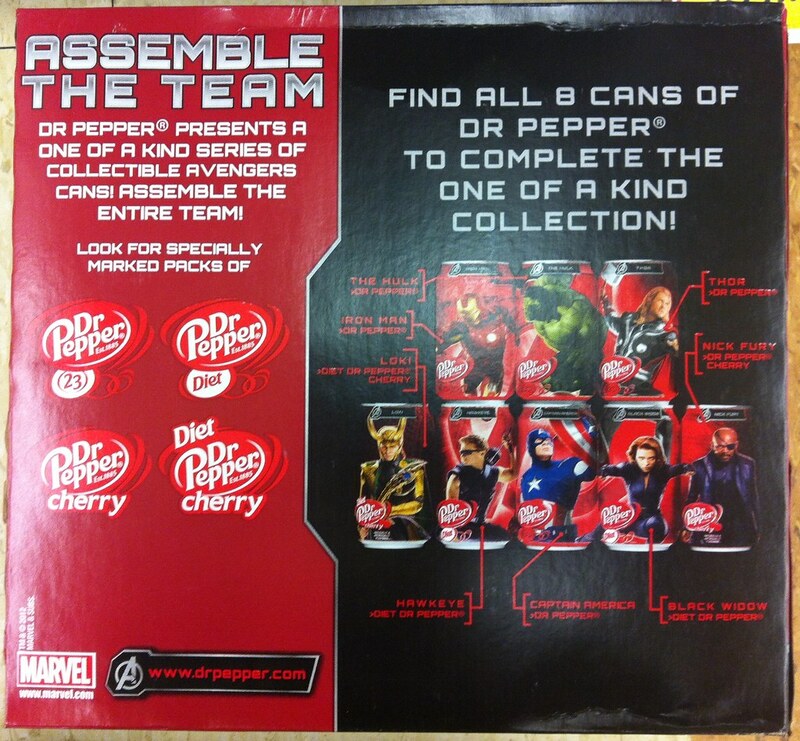 Currently, Dr Pepper has a promotion called “Assemble the Team”. The promotional packaging is starting to show up en mass at retail locations everywhere. 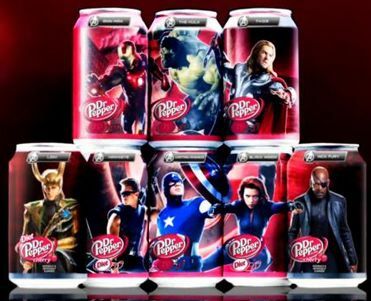 The promotion consists of 8 collector cans featuring the principles of The Avengers (Nick Fury, Captain America, Iron Man, Thor, Hawkeye, Black Widow and Hulk) as well as one can featuring the film’s villain (Loki). Here’s an official picture of the set. 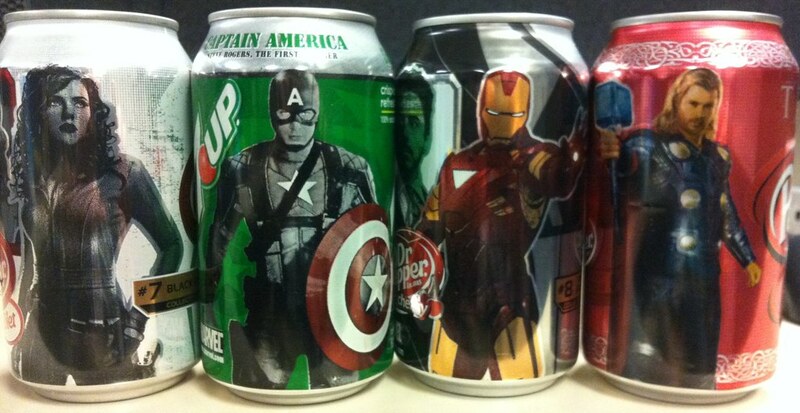 Up to today, I have found five of the eight cans so far; Capt America, Nick Fury, Hulk, Hawkeye and Black Widow. However, since Iron Man 2 came out in 2010, most of these characters have already shown up on several soda can promotions. Let’s take a look back at these other Marvel movie can promotions. Well, I mentioned Iron Man 2 was the first in 2010 to get soda treatment. 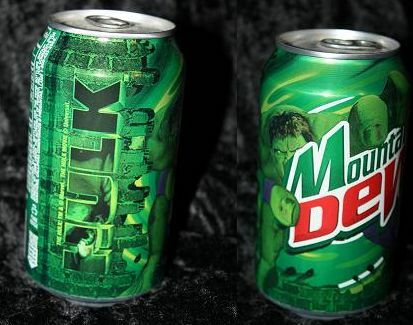 However, technically, in 2003, the Hulk was featured on a Mt Dew can. It was promoting Ang Lee’s Hulk. And since Hulk was/is a part of the Avengers, I will mention this can. 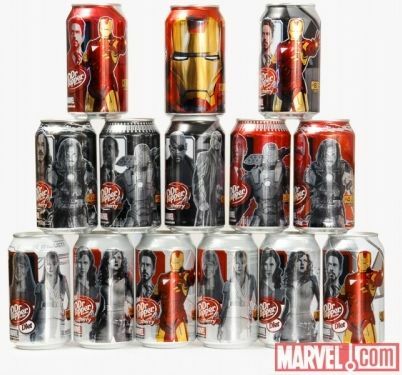 Next, in 2010, like I said earlier, Iron Man 2 received 7 character cans on Dr Pepper. There were actually about 14 different cans, but only 7 unique characters were featured. This set would feature the Avengers Iron Man, Nick Fury and Black Widow. Here’s the full set. The hardest to find? Nick Fury on Dr Pepper Cherry. Amongst the character cans you’ll notice there was one special Iron Man “helmet can” (top center). The can was decorated to look like Iron Man’s Mark VI helmet. It was probably the second hardest to find. Then, in 2011, Thor also received a Dr Pepper collector can promotion. Thor’s set featured 6 unique cans showcasing the characters Thor, The Destroyer, Heimdall, Loki, Sif and the Warriors Three. Unfortunately no Jane or Odin. Here is the full set of six cans. In addition to the six regular cans there was a bonus Thor “Hammer” can. The “Hammer” can was similar to the Gold Yoda can in that you won something if you found it. Here’s a picture of the Thor “Hammer” can. Notice it’s decorated to look like Thor’s hammer, Mjolnir. In Canada, there was a Mega-Size Thor Dr Pepper can that was decorated the same as the Hammer can. See it here. Then, in Summer 2011, Captain America would get the collector can treatment. However, instead of Dr Pepper, the Capt America cans were featured on 7-Up and its brands like Sunkist and A&W Root Beer. It featured 5 character cans; Capt America, Howard Stark, Bucky Barnes, Peggy Carter and Red Skull. The Red Skull on Cherry 7-Up is my favorite. But the Cap on Regular 7-Up is also cool. So those are the breakdowns of the modern Marvel movie character cans. Hopefully they will continue to do this moving forward after The Avengers. This entry was posted on April 25, 2012 at 9:00 am and is filed under comic books, Dr Pepper, Mountain Dew, movies, soda with tags Dr Pepper, Marvel Comics, Mountain Dew, movies, pop culture, soda, sodapalooza, The Avengers. You can follow any responses to this entry through the RSS 2.0 feed. You can skip to the end and leave a response. Pinging is currently not allowed. No Odin Dr. Pepper can?? 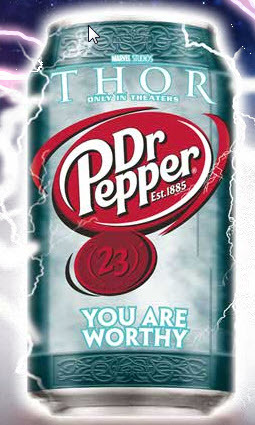 You’re a vain, greedy, cruel soda Dr. Pepper! It has been cast out, Robert. That’s nice. It must have been a packaging mistake. When will the Loki for Avengers show up in the Diet DrPepper Cherry? I have yet to see it. I have all the others. When that Mtn Dew can for Hulk came out I called it Hulk Soda. Now anybody can become the Hulk with a can of this monster’s gamma radiation. I just acquired the Loki can. It’s been showing up the last week or so in my area. Thank You sincerely for your response. Still at this point I haven’t seen anything. I even asked a DrPepper supplier if they had seen anything. He said he has seen everything but the Loki can. I have an inflatable Yoda can that I got from a friend that works at Pepsi. if i have 6 full cans and 2 empty unopened cans will the collection be worth anything someday or do they all have to have soda in them to be a complete series set? I don’t like what you are saying.It really takes time.I have been putting on weight.Can you believe that I bought a TV for $25?My false teeth are stuck to it.I tried losing weight£¬ but nothing workedI tried losing weight£¬ but nothing workedThe teacher got a little angry.Who’s calling? I’d like to-repair our differences. Question. I want to start collecting these. Should i buy empty cans or full cans? Just your personal opinion will help.